I had the pleasure of speaking to the Entrepreneurial students at California State University in Fullerton. I met some bright young minds with some great ideas. My message for them was that while social media is popular, it is only a part of a good overall marketing strategy. I will be giving a presentation at the Placentia chapter of the Christian Business Partners called Business by The Book: Aligning Your Organization with Biblical Principles. Successful organizations have something in common, they are aligned with a set of principles that allow them to prosper. This presentation covers what principles are, where they come from and how to align with them. Let me know if you would like to visit as my guest. This is a free networking group for Christians to support each other’s businesses. You do not need to be a Christian to attend. Let me know if you would like to attend. I was honored to speak at the CSUF Center for Entrepreneurship about HOW TO: Convert Web Traffic into Customers Using SEO and Inbound Marketing. We had a great response and the event was sold out. I will try to give the presentation again for those who could not attend. The slides from the presentation are below. If you want to know if your website is designed to convert site visitors into customers I am offering a free website audit. · How can you meet the needs of the target audience better than the competition? · What is the positioning of your product or service? · What is the mission or purpose of your company? · What goals do you want to accomplish with this particular product or service? · How do these goals fulfill the mission of your company? · How will you communicate this to the entire organization to make sure everyone is on the same page? · Based on the competitive advantage, positioning, target audience and mission of the company what image best represents your product or service? · Do you need professional assistance in creating a logo and marketing communications materials? · Is the look and feel of your marketing communications materials consistent and congruent? · Which of these marketing communications do you plan on utilizing? · What marketing communications can you afford? · What marketing communications make the most sense for your situation? · How can you achieve the greatest return on investment with the least amount of wasted exposure? · Are your marketing communications linked and integrated? How? · Are your marketing communications consistent and congruent? How? · How are you building relationships with customers? · Are you creating positive word of mouth? · Are you developing advocates for your product? · Where in the funnel do your promotions hit? · How do your promotions push people down the funnel? · How are you measuring results? · Have you implemented ways of gaining feedback from customers? · Have you implemented ways of gaining feedback from employees? · Are you making changes based on the feedback you have gained? · Has your market or target audience changed? · Do you need to revise any marketing messages to remain current? · Are you maintaining up to date and relevant information on the website? · Do you have an ongoing dialogue with current customers? Want to learn more? 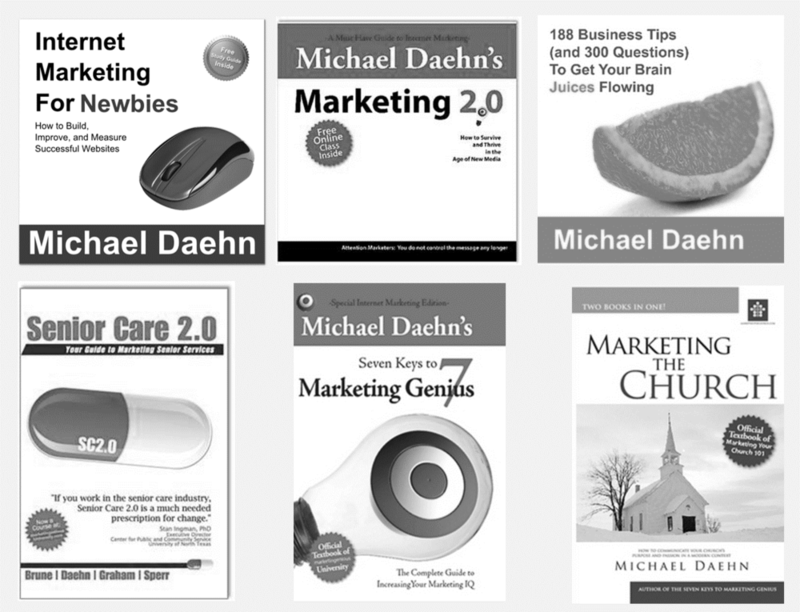 Read the full book by Michael Daehn: The 7 Keys to Marketing Genius. I put together this quick overview of Google Analytics for my clients. Google Analytics is a fantastic tool that every website owner should be using. It has so many powerful tools it can be overwhelming, but don't be intimidated. Every site owner should have some key performance indicators (KPI's) that they track. Things like visitors, sales and traffic sources are easy to set up and follow. And like a lot of Google products, Google Analytics is free. So get started by visiting Google.com/Analytics.